The origins of the wok can be traced back to China, but there is no denying that they are now almost becoming a standard piece of cookware all over the world, and for good reasons. For the uninitiated, a wok is a traditional Chinese pan that can be used for a range of cooking techniques. Woks were originally made from cast iron which is durable and provides good heat retention properties. However, cast iron woks can be extremely heavy which is why they have now mostly gone out of fashion. Carbon steel, on the other hand, is the perfect alternative. Carbon steel is basically a cross-over between cast iron and stainless steel. Woks made of this material are much lighter than cast iron woks, but just as durable. Just like cast iron, carbon steel retains heat really well. Once it gets hot it stays hot which allows you to achieve a steady temperature while cooking. Arguably, woks have become so popular that it can be hard to choose which one to get with so many options available. What is the best carbon steel wok brand? Should you choose a flat-bottomed or a round-bottomed wok? How can you distinguish a high-quality carbon steel wok from cheap knock-offs? These are all questions that we will try to answer today in order to help you find the best carbon steel wok. See also: Reviews of the ultimate carbon steel pans. 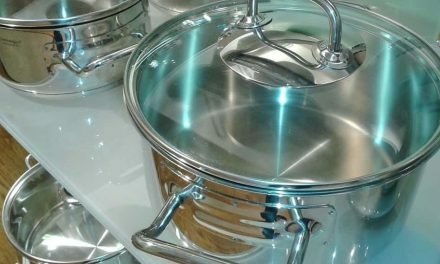 Mauviel is a French cookware manufacturer with a long history of making great products. In fact, they have been around since 1830 – more than two centuries! The fact that they have survived the test of history tells us something about the quality of their cookware. You’ve probably heard of Mauviel as one of the most well-known manufacturers of copper cookware, but actually, they have a lot more to offer. In fact, they make a wide range of both professional and household items from a range of materials including stainless steel, aluminum, and, of course, carbon steel. Mauviel’s M’Steel collection contains a range of high-quality pans made of carbon steel. One of our favorites is, of course, the Mauviel Made In France M’Steel Black Steel Wok. 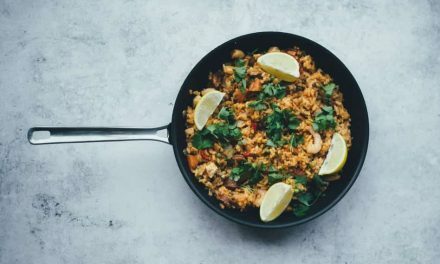 For the M’Steel pans, Mauviel has used commercial-grade carbon steel which is exceptionally thick resulting in cookware that can easily last a lifetime with proper maintenance. It can stand extremely high temperatures so you could even use this wok to cook over an open fire if you wanted to. The guys at Mauviel really care about the tiniest details and go the extra mile to ensure the quality of their products. This is why your Mauviel Made In France M’Steel Black Steel Wok will come covered with beeswax when you buy it. This is to prevent any rust or damage that might appear prior to first use and seasoning. You can wash the beeswax off with hot water when you buy the pan, and then proceed with seasoning with your favorite oil. If you renew the seasoning on a regular basis, the wok becomes more and more non-stick! This wok has a flat bottom, which makes it easy to use on modern stoves. Just like any wok, it has a smaller diameter at the bottom, sloping sides, and a large opening at the top. The diameter at the top is 11.8 inches. This is a smaller type of wok. It’s not large enough to cook a family meal at once, but it’s perfect for quick stir-frying where you can make multiple batches in a matter of minutes. This is what woks are made for, after all. Finally, the Mauviel Made In France M’Steel Black Steel Wok is really beautifully designed. The elegant shape is complemented with an angled, 9-inch long handle on one side and a helper handle on the other side. Handles are made of iron and tightly attached to the wok. Overall, this is a great, quality wok. The price is a bit higher than some other options, but you can consider it an investment, since Mauviel cookware was really built to last. The pan is sturdy and well-balanced and quite heavy. Certainly one of the best flat bottom carbon steel woks on the market. Craft Wok is a brand that focuses specifically on carbon steel woks. Their woks are completely authentic, made in China, and feature a traditional design with a round bottom. The Craft Wok Traditional Hand Hammered Carbon Steel Pow Wok with Wooden and Steel Helper Handle was made in Guangzhou by highly trained professionals. The wok is hand hammered, which is the old-school way to make a wok. Hand-hammered woks have small indentations on the surface that remain after hammering. However, these are not a problem, but actually and advantage, since they make it easier to move the food around. Traditional Chinese wok pan. Do not forget to season it before use! You’ll definitely enjoy making stir-fried veggies and meats in this wok. It heats up quickly, it maintains a stable temperature, but it also responds reasonably quickly to temperature changes. What more could you ask for from a wok? On one side, you will find a triple-riveted wooden handle with a steel end. The wood is a really nice touch, and you can also unscrew the handle in case you wish to place the wok in the oven. The helper handle on the other side is made of steel which allows it to remain cool while you are cooking in the pan. It can also be useful if you decide to hang your wok when it’s not in use. The wok itself is made of 15 gauge, 1.8 mm thick carbon steel which makes it thick enough to provide consistent performance, but also not overly heavy. The Craft Wok Traditional Hand Hammered Carbon Steel Pow Wok with Wooden and Steel Helper Handle weighs 4.39 pounds which is quite manageable and a bit lighter than many other woks. This wok is 14 inches wide, which is the standard size for home use. It is big enough to allow you to comfortably cook a meal for 3 or 4 people. This pan has a round bottom, which means it will not stand by itself on flat stoves like electric or induction. By itself, it can only be used over an open fire or on a gas stove. However, with a wok ring, it can be adapted for electric stoves too. There are a couple of reasons why we loved the Craft Wok Traditional Hand Hammered Carbon Steel Pow Wok with Wooden and Steel Helper Handle. First of all, it is absolutely beautiful. The traditional hand hammered look just looks stunning, so much so that you’ll probably want to find a nice place to display your wok in the kitchen. Moreover, it provides perfect results every time, no matter if you are doing a stir-fry, a soup, or using the wok for deep frying. If seasoned properly it will last for years too. 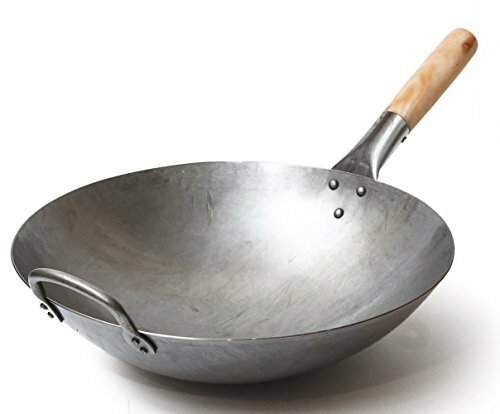 Even though woks were originally made from cast iron, even Chinese chefs prefer using carbon steel woks today. It simply performs much better. Carbon steel responds better to temperature changes, and it is also much less heavy than cast iron. At the same time, it is just as durable. 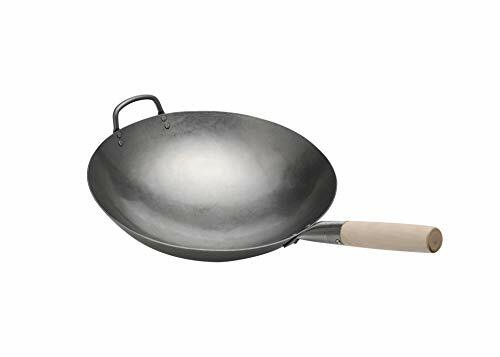 The Pow Wok Stir Fry Pan is a hand-hammered wok with a traditional rounded bottom. The carbon steel is 1.8 mm thick, a thickness that creates a perfect balance between impact-resistance and weight. The pan is very well balanced, easy to handle, and feels great in your hand. The fact that it is hand-hammered means that the cooking surface of the Pow Wok Stir Fry Pan is slightly uneven. However, this is the original way woks were made for centuries, and there are good reasons for that. The hammering pattern on the surface allows you to move the ingredients around more easily. Thus you can place certain ingredients on the sides of the wok to cook slower than those in the middle, and they will stay there instead of sliding down. The top opening of the wok is 14 inches wide, the standard wok size for cooking a family meal. This wok features a wooden handle on one side and a helper handle on the other for easy maneuvering. The handles provide a good grip which is really important when stir-frying. Just like most carbon steel woks, the Pow Wok Stir Fry Pan comes without any coatings on the metal. This means it completely PTFE and PFOA-free, unlike many non-stick woks. 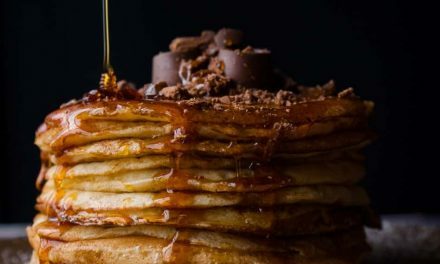 You will need to create your own non-stick coating, though, by seasoning the pan. However, this is quite a straightforward process that has many benefits. Seasoning your pan will make it last longer, and the more you use it the more non-stick it will become. This wok weighs just under 5 pounds which places it in the middle range regarding weight when compared to other stainless steel woks available on the market. This is a great wok for everyday use that comes at quite an affordable price too. However, it is still made of quality stainless steel, well-balanced, and has handles that are securely riveted. You will certainly enjoy making various stir-fried dishes in the Pow Wok Stir Fry Pan. However, it is also quite versatile as you can use it for deep frying, making soups, and even steaming. Chef’s Medal is a small company dedicated to offering high-quality cookware that is highly functional. Their Traditional Hand Hammered Carbon Steel Pow Wok with Bamboo Handle and Steel Helper Handle is made using the traditional hand hammering technique. It is made in Guangdong, China, where woks have been made for hundreds of years. Hand-hammered woks have small indentations on the surface that remain after hammering. However, these are not a problem, but actually, an advantage, since they make it easier to move the food around. On one side of the pan, you will find a triple-riveted bamboo handle with a steel end. The bamboo handle is a really nice touch. It has a sleek finish which is comfortable to hold and it gives the wok a unique appearance. The handle also has a hole at the end, which can be really useful if you want to hang the wok somewhere in your kitchen. And why wouldn’t you? It looks awesome, and you’ll definitely use it often! There is also a helper handle on the other side which aids with stirring and shaking the pan. The Traditional Hand Hammered Carbon Steel Pow Wok is made of 1.8 mm thick carbon steel which makes it thick enough to provide consistent performance, but also not overly heavy. The wok weighs 4.8 pounds and it’s 14 inches wide. This pan has a round bottom, which means it will not stand by itself on flat stoves like electric or induction. This is a classic wok made for Asian-style cooking, but also useful for various other cooking methods. Use it on a gas burner or on an electric stove with the addition of a wok ring. The two handles are quite comfortable so you can easily handle the wok, and you can use metal utensils without worrying about scratching it. With proper seasoning, the pan will also become increasingly non-stick, which is a great alternative to chemical-based non-stick coating. We’ve chosen the Joyce Chen 22-0060, Pro Chef Flat Bottom Wok Uncoated Carbon Steel because it’s a high-quality wok that comes at quite an affordable price. This carbon steel wok conducts heat really well, but it is much lighter than cast iron. However, it is still constructed from heavy-gauge, 2 mm thick carbon steel which makes it really sturdy and capable of enduring years of use. In general, carbon steel woks have many advantages when compared to alternatives, and the Joyce Chen 22-0060 Wok is the perfect example of this. Cast iron alternatives are just too heavy, while stainless steel doesn’t conduct heat well enough. Furthermore, as this wok is made of uncoated carbon steel, you get to season it the way you like it. The traditional Chinese way to season a wok is with oil, scallions, and ginger. However, you can season it with any kind of oil you want. Grapeseed, peanut, and canola oil all work great. If you are new to carbon steel cookware, you might have doubts about seasoning your own pan, but don’t worry, it is reasonably easy to do. You just need to wash the wok before first use, heat it up, add the oil of choice. If you are not satisfied with the seasoning, you can always repeat the process. Furthermore, this wok features a flat bottom which makes it suitable for use on all kinds of stoves. It will work with induction too. If you regularly use a flat cooktop, a flat bottom wok is just the most practical choice. The Joyce Chen 22-0060, Pro Chef Flat Bottom Wok has sloping sides and a wide diameter at the top of 14 inches. Finally, the Joyce Chen 22-0060, Pro Chef Flat Bottom Wok features a long, double-riveted phenolic handle that remains cool on the stovetop. There is also an additional helper handle on the other side for easier handling. You can use metal utensils with it but keep in mind that the pan is not dishwasher-safe if you want to avoid damage. We like the Joyce Chen 22-0060, Pro Chef Flat Bottom Wok because it’s sheer proof that you don’t need to spend a fortune in order to get a functional wok that will last for ages. This pan looks beautiful, works on all kinds of stoves, including induction, and provides consistent results every time. Hands down, it’s one of the best flat bottom carbon steel woks we have found. A good wok is a great addition to every kitchen. 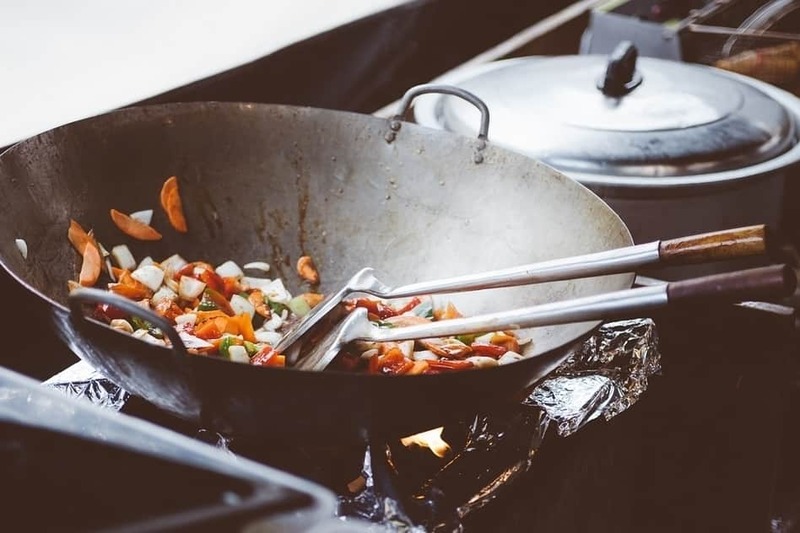 Even though the first thing that comes to mind when we think of a wok is Asian-style cooking, woks are actually great for experimenting with different methods of cooking too. For example, there are many chefs that will tell you that a wok is actually the best pan for deep frying. Even though deep frying is not their primary purpose, woks actually work great for this cooking method. The sloping sides, the wide opening and the flat bottom allow for consistent results when deep frying. There is really no end to creative uses one can find for a wok. Traditionally, woks had rounded bottoms because they were used for cooking over open fire. Today, many manufacturers make woks with flat bottoms to make them compatible with modern stoves. In a standard kitchen, round bottom woks will work only with gas burners. However, there is also a way to adapt them to any kind of stove, you just need a wok ring, like the Thunder Group Alsr001 Steel Wok Rack. It is a simple circle that accommodates the round bottom of the wok and allows it to be stable on flat surfaces too. 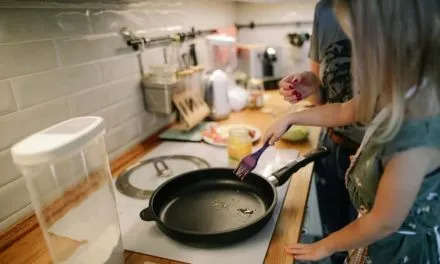 On the other hand, if you already know that you’ll be using the wok on a flat-top stove, such as electric or glass, you might just choose a flat bottom wok as a simple solution. There is nothing wrong with it. Finally, if you have an induction cooktop, you won’t be able to use round bottom woks without a special burner, so opt for a flat bottom wok instead. If you are looking for the best flat bottom carbon steel wok, try the Joyce Chen 22-0060, Pro Chef Flat Bottom Wok Uncoated Carbon Steel or the Mauviel Made In France M’Steel Black Steel Wok. When it comes to round bottom woks, we love all three that we mentioned in this list. The differences are minor and they are all really good pieces of cookware. All three of them are made of high-quality carbon steel using the traditional hand hammering method. The Traditional Hand Hammered Carbon Steel Pow Wok with Bamboo Handle and Steel Helper Handle by Chef’s Medal, for example, has a bamboo handle, and the other two woks we mentioned have handles made of wood – both are good options, it just comes down to personal preference.